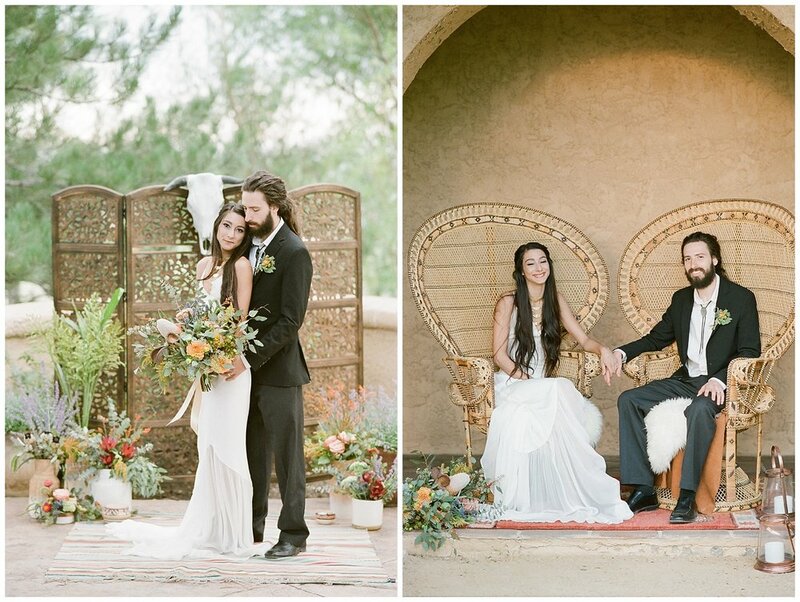 I had such a fun time being a part of a Southwest Wedding Inspiration at Villa Parker with some amazing vendors! Tamara Gruner Photography captured everything beautifully. Sarah O. Jewelry makes the most gorgeous and unique pieces. I love everything she creates! This stunning necklace was handmade by Stacy Sterling, she does such amazing work! It accented this gown from Emma and Grace Bridal perfectly. Liz, at Beauty on Location, styled the bride's hair and make up with a subtle and organic look. I chose flowers with lots of texture and muted sunset colors. Some of the florals and foliage I used were protea, eucalyptus, scabiosa pods, poppy pods, amaranthus, thistle, dahlias, and crocosmia. Having someone customize your wedding with calligraphy is a great way to add special details to areas like your guestbook table, seating chart, or bar area. CURATE events + design created these beautiful invitations and drink menu. 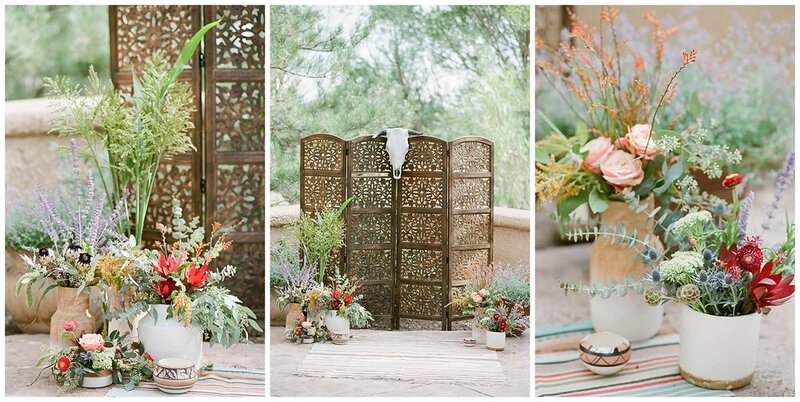 We created a bohemian ceremony with an ornate wooden screen, Navajo rugs and organic, textural florals in terra cotta and white ceramic containers. I loved all the details Celynn, with Tied with a Bow , added to the table. 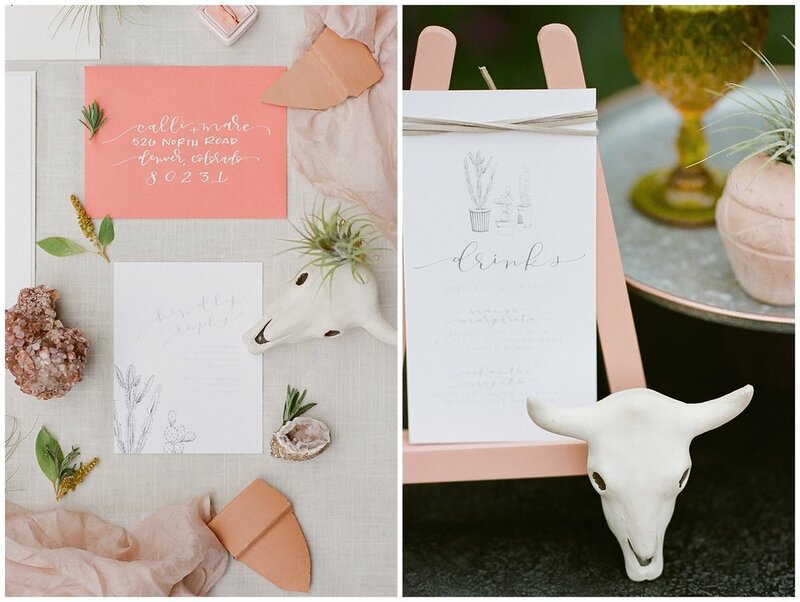 These amazing rentals were from Hunt and Gather and fit the look perfectly. A wedding wouldn't be complete without dessert! These cookies are adorable and the details of the cake were just perfect! Honeycombe did a fabulous job!